Hi everyone. I connected my student association Facebook account using Publicize (Jetpack plugin) with our WordPress website and at first, it worked: I could post on my blog and push the new post on our Facebook page (not profile, page). Last night, the feature wasn’t working, so I removed the connection. Now, I can no longer connect my Page to Jetpack. 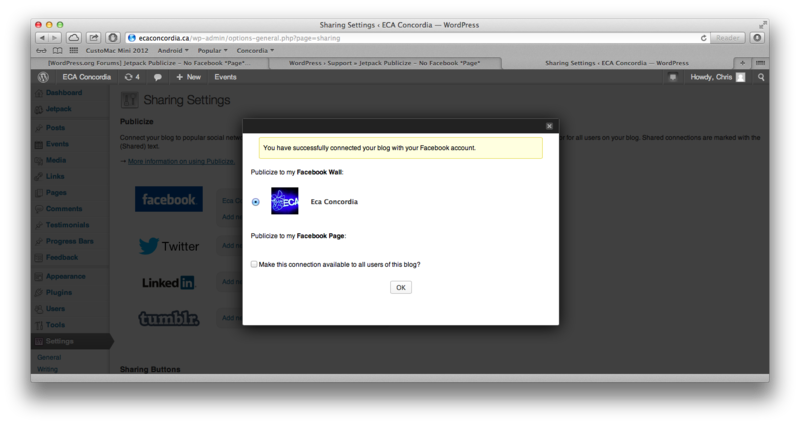 I have removed WordPress’ permissions from Facebook and retried the connection, but all I see is my association’s Facebook Profile, not its Page. I am really at a loss. Can anyone help? The blog I need help with is ecaconcordia.ca. Here’s what I currently see: screenshot. Other Jetpack users have also reported this issue, and we’re currently looking into it. I will post back here as soon as we can address the issue. Would that be of help? Same here… seems to be a global problem. Anyone with the problem using Go Daddy hosting? That’s what I’m using in case it’s a common thread between us? Jeremy there’s any ETA for fix this issue? Same here. Im on Bluehost. Its not showing my pages. This is exactly what am facing..I even tried to revert back to some previous version of Jetpack..after uploading…still the same result. I’m also experiencing the same issue, and also tried reverting back to previous versions of JetPack (2.25 and 2.3) without success. I am seeing this too, I guess FB must have changed api again. I agree with garymoncrieff’s theory. Jeremy do you have any update for us at the moment? or are you still looking for the cause of the problem? Everyone – it’s a long holiday weekend in the US – and the JetPack people work for Automattic/WordPress.COM, so they probably are not working until tomorrow (Monday). I’m sure Jeremy and the others will get back to this thread as soon as they have a solution for this problem. The topic ‘Jetpack Publicize – No Facebook *Page*’ is closed to new replies.